Konung III is a RPG, based on the Scandinavian and Slavic mythology, the third game in the Konung series (Konung: Legends of the North and Konung 2: Blood of Titans). 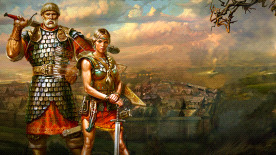 The new game brings the player back to the legendary Woodland – the unique and spacious fantasy land that combines parts of known history with classical myths of the Slavs, the Scandinavian and the Byzantine, as well as the legends of the Chronicles, including immortal heroes, magical artifacts and ancient sorcery world. © 2010 1C Company. All rights reserved. The Engine © 2002-2010 Skyfallen Entertainment. All Rights reserved.